This week has worked some small currents of disarray into my life, and it’s been fortunate for me that I’ve remembered how it was, years ago, when I watched a stream near my house settle after I had stirred it up with a stick. I recall being astonished, again and again, when I waited beside the stream and watched it slowly settle and become clear again. Even at seven, I saw that there was some sort of law at work – that the stream always sorted itself out and re-established a kind of peaceful transparency. 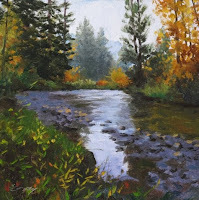 No matter how many times or how vigorously I swirled the water and the sand, the stream – a small, shiny one I considered mine alone – always went back to its basic clearness and composure. What was most wonderful was that I didn’t have to do anything. The settling happened by itself, while I did nothing but sit silently by and notice sand and water quietly clearing itself up. These memories made this fairly confused week a little quieter, and thus somewhat easier to accept. Somewhere around midweek, I decided to give up getting frustrated and full of unease, and just began to be still and watch the waters of my life slowly settle -- as they did, over and over again. Something would happen to stir things up, but always, if I stood aside and simply observed, all would soon enough come back to quietness. Once, in fact, after I messed up a 9th grade English class fairly completely, I stood outside and simply waited. I saw myself beside my special stream as a boy, and soon I saw the waters, and my seemingly disordered teaching, settling into their inborn and beautiful stillness.